On Saturday of the four day weekend, I got into my car and turned south-east. 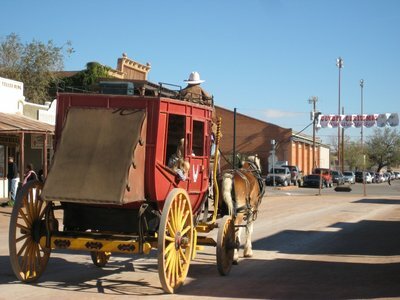 I drove 200 miles, and ventured 130 years into the past to the wild, wild west. 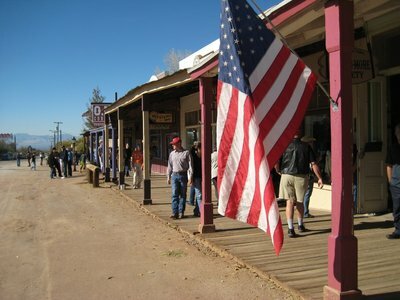 Tombstone, Arizona was founded in 1879 by Ed Schieffelin. He was in the army, and spent his spare time searching for gold in the area known as Goose Flats. He was told by his fellow soldiers that there is no gold in the hills, and that "the only rock you will find out there will be your own tombstone." Schieffelin never found gold, but he did find silver. Lots of it. Schieffelin became incredibly rich, and he renamed the town of Goose Flats, calling it Tombstone in honour of the jokes that his fellow soldiers used to make. 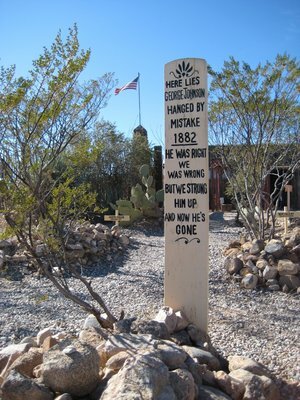 Tombstone became a boom town, with it's population rising from 1,000 to 15,000 within one year as miners, prospectors, business people and labourers came to town. The farmers who used the land for their cattle were soon at odds with the new immigrants, and violence was common. Most famously, on October 26, 1881, there was a gunfight at Harwood's lumberyard where three men died and another three were injured. The local law, including Wyatt Earp, his brother Virgil and tuberculosis sufferer "Doc" Holliday faced off against local cowboys, including Billy Clanton, Tom McLaury and Frank McLaury. The fight lasted 30 seconds, with 30 gunshots ringing out. 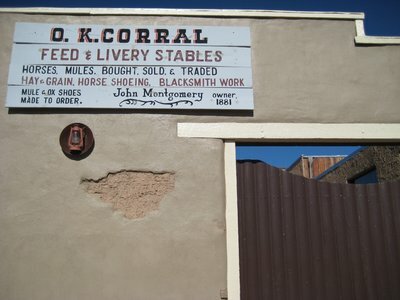 The gunfight became mythic, and ended up being known by the name of the nearby horse enclosure. The bodies of Clanton, and the McLaurys were taken up to the graveyard up on Boot Hill. 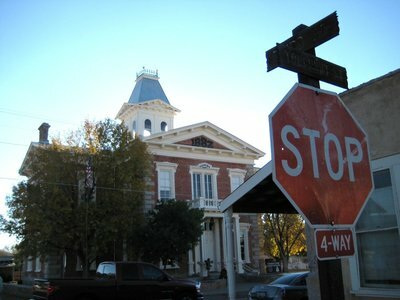 Once the silver veins dried up, the town declined, saved from becoming a ghost town by the fact it was the county seat for Cochise County and has the courthouse. 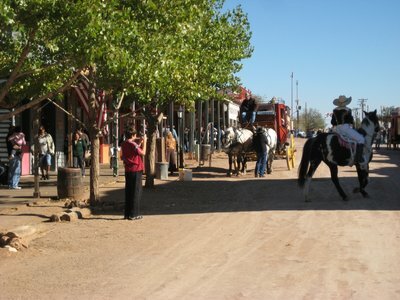 Today, Tombstone is best known as a tourist destination, and the Allen Street between Third and Sixth is maintained in a semi-historically accurate state. 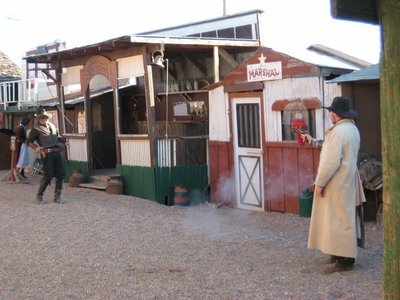 There are numerous places where historical re-enactments occur, especially of the gun fights. I saw the show at the Six Gun City, which included a few different historical gunfights. 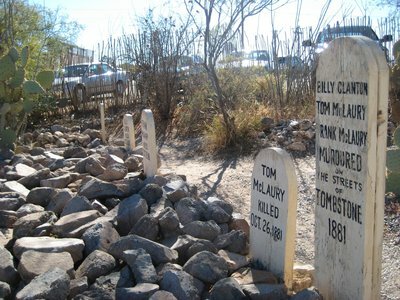 Out on Highway 80, the Boot Hill Graveyard still exists. 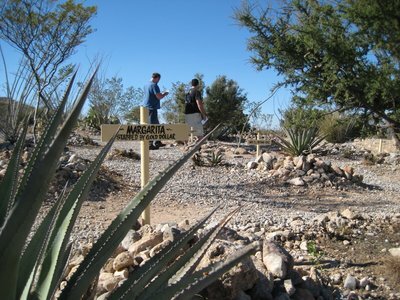 Entrance is free, but for a $2 donation you can get a map and legend to those buried in the cemetery. Margarita was a "dance hall girl," who was quarrelling with another lady of the evening over a man. Gold Dollar, the other girl, stabbed Margarita to death. Must of been a heck of a man to have two prostitutes fight over him in a town full of rich miners. It was interesting to see Tombstone, but the whole thing is a little too campy and showy. The town is still alive, and 1,500 people live there. Walking around, I kept wondering what the residents think of all these tourists tramping through their town, snapping photos of actors dressed up like cowboys, marshalls and madams. 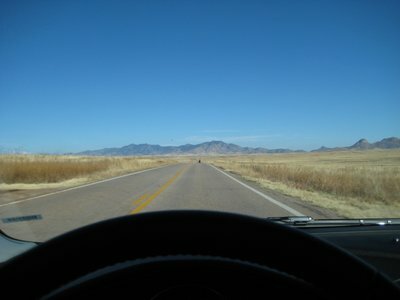 After the gunfight show, I hit the road quickly and got back out on the drive. Just north of Tombstone the highway was blocked off by the US Border Patrol. They were stopping all the cars heading north. No doubt this was to try and catch any Mexicans that had crossed the border illegally and picked up a ride north. Seeing me, the border guard waved me on without saying a word. Little did he realize that I am, in fact, a foreigner here to steal American jobs. Estupido gringo. Solidarity, my Mexican brothers. I will point out, in case anyone from the US Border Patrol reads this, that I am here legally under the NAFTA (North American Free Trade Agreement), so I'm only stealing American jobs in a job category that has been identified as being one I am legally able to steal American jobs and with the appropriate documentation. 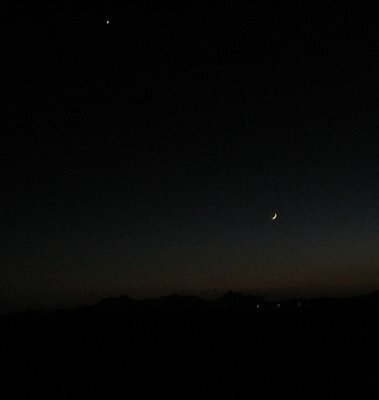 As I got north of Tucson, the sun set in the west, throwing up purple and red light above the mountains in the west, and a sliver of the moon came out. Flipping through the stations on the XM Satellite radio, I came across Don Henley singing "Boys of Summer." I crank up the tune and sing along. Forget the destination, with the windows down and classic rock playing on the road, the best part about a road trip is the journey.